South India Luxury Tour is one of the grand offerings from Incredible India tour, allowing tourists a surreal experience of entire southern peninsula. Beginning from Mumbai, the tour ventures southwest towards Chennai, famous worldwide as the gateway of south. This begins the journey to the renowned temples of this state in Mahabalipuram, Tanjore and Madurai. The journey furthers towards Kanyakumari, the southernmost tip of India where three seas meet and create a unique beach experience for the tourists. The second luxurious state in the journey, Kerala invites tourists to undergo the natural luxury of being on a balmy beach in Kovalam and lazy backwater trance in Alleppey. This leads tourists to Ooty, the hill station oozing innocent charm of the Blue hills / Nilgiris. Later, the journey ventures into heritage stretch of Karnataka through Mysore and Hassan (Belur-Halebeedu) and acquaint tourists with the glorious creations of Hindu rulers in south. The luxury tour receives a perfect conclusion in the beach capital, Goa and its luxurious hospitality, rejuvenating tourists from within. Upon arrival at Mumbai Airport, (International / Domestic), meet Incredible India tour representative who will assist your transfers to Ramada Plaza Palm Grove. Overnight stay. After breakfast, explore the city of Mumbai, pulsating with pacy culture and rich heritage. First sightseeing of South India Luxury Tour includes a visit to the 1,200 years old Elephanta Caves across the harbour. Afternoon begin Mumbai city tour by visiting the Gateway of India, Prince of Wales museum, Raja Bhai Tower and The Flora Fountain, the hub of Mumbai's life on the move. Overnight stay. Breakfast at hotel and check out the city to board the flight for Chennai & upon arrival meet the Incredible India Tour at the airport & transfer to The Park, Chennai. Overnight stay..
After breakfast, begin half day Chennai city tour while visiting Art and Bronze Gallery (Closed on Fridays and Public holidays). Fort Museum, Marina Beach, Santhome Cathedral and Snake Park. Afternoon is free to explore the cosmopolitan Chennai. Overnight stay. After breakfast, check out Chennai and drive to Mahabalipuram. On arrival here, check into Radisson Temple Bay. Afternoon visit the city best-kept heritage on a drive. The interesting places are Thirukadalmallai, Shore Temple, Pancha Pandava Rathas etc. 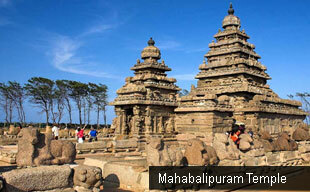 Also, a world heritage site, the suburb of Mahabalipuram is famous for the seven pagodas. Built by the Pallavas, this rock cut seashore also displays an interesting group of ancient rock hewn temples which illustrate Dravidian architectural style. Overnight stay. After breakfast, check out Mahabalipuram drive to Pondicherry. On arrival, check into The Promenade. In evening, begin city tour with chauffeur assistance. The capital of French enclave in India before independence, Pondicherry traces its origin to Saint Agastya, the revered sage of south. Now, it's a quiet territory with serene culture and rocky beach. Overnight stay. After breakfast, drive to Tanjore, on arrival, check into Ideal River View Resort. Evening visit the city with chauffeured assistance. This is a city renowned for its world heritage site, courtesy Chola temple of Brihadeeshwara. This living Chola temple boasts of a monolithic cupola made of a single granite block weighting 80 tons which was taken to the top with the help of a 6 km long ramp. Along with it, the bronzes and handicrafts also makes Tanjore one of the luxurious highlights of a visit to south India. Overnight stay. After breakfast, drive to Madurai and upon arrival, check into The Gateway Pasumalai. 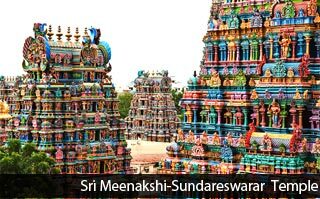 Afternoon visit the great Meenakshi temple, the symbol of Madurai dedicated to the consort of Lord Shiva / Sundareswar with its towering gopuram gateways with sculpted panels. Overnight stay. After breakfast, full day excursion to Rameshwaram via chauffeured assistance. The islet of Rameshwaram is a sacred zone for Hindus and holds importance as one of the Char Dhams. According to Ramayana; here Rama worshipped Lord Shiva to absolve himself of the sin of killing Ravana who was also a Brahman by birth. A dip into the sacred waters of the Agnitheertham Sea which was calmed by Rama is a must for Hindus. Later return to Madurai. Overnight stay. After breakfast, drive to Kanyakumari. On arrival, check into Sparsa Resort. Kanyakumari is India's land end where the waters of the Arabian Sea, the Bay of Bengal and The Indian Ocean meet. This coastal town is also famous for the Amman temple, dedicated to the virgin goddess, Kanyakumari. Offshore the beach is the Vivekananda Rock Memorial, a blend of all the architectural style of India. Evening witness the surreal sunset over the beach. Overnight stay. After breakfast, drive to Kovalam. On arrival, check into The Leela Kovalam. Later free to enjoy on beach own your own. Kovalam in Kerala is known for its luxurious beaches stringed one after another. Here, besides lazing on the beach, one can also avail the Ayurvedic oil massages and oil baths. Overnight stay. After breakfast, drive to Alleppey. On arrival, check into the Deluxe Houseboat. This is another highlight of the tour focussing on the pristine backwater wealth of Kerala. The coastal town of Alleppey on the Arabian Sea boasts numerous canals that meander through the town and offer an enchanting experience of life. Overnight stay at houseboat. After breakfast, drive to Kochi. On arrival, check into Holiday Inn / Courtyard by Marriot. Overnight stay. Breakfast at hotel. Later half-day Kochi City Tour. Kochi is naturally created mud-banks harbour whose quality ensures that the rougher the seas are outside, calmer the waters within. Vasco-de-Gama placed it on the world map. The city's resplendent attractions include Jewish synagogue (closed on Fridays & Saturdays), Portuguese churches, mosques and Hindu temples. Watch the Chinese Fishing Nets. Afternoon free to explore the city own your own. Overnight stay. After breakfast, check out Kerala and drive to Ooty in Karnataka. On arrival, check-into The Savoy. Also known as Udagamandalam, Ooty is the "Queen of hill stations" and the capital of Nilgiris district. Nilgiris or the "Blue Mountains" presents a scintillating hill station filled with picturesque picnic spots. Used to be popular summer and weekend getaway for the Britishers during the colonial days, this is now a favoured retreats for the tourists of all kinds. Overnight stay. Morning breakfast at hotel. Day is free to explore the charming Ooty on your own. Overnight stay. Morning after breakfast, drive to Mysore and upon arrival check – in to the Fortune Park JP. Afternoon city tour of luxurious Mysore; characterized by palaces, sandalwood, and intricate handicrafts. Visit the Palace of the Maharaja built in 1911-12, based on the Hindu and Saracenic styles of architecture combining the archways, domes, turrets, colonnades and sculptures. Also visit the Art Gallery and drive to the Chamundi hill to see Chamundeshwari temple and enjoy a panoramic view of Mysore. Overnight stay. Morning breakfast at hotel. Drive to Bangalore, upon arrival at Bangalore check into Crowne Plaza. Overnight stay. Morning breakfast at hotel and later half-day city tour of Bangalore, visit the Lall Bagh with a variety of old trees, fountains, lotus pools, terraces & an assortment of roses. Also see the Maharaja's Palace & Government Buildings. Afternoon free to explore the city own your own. Overnight stay. After breakfast at hotel, transfer to the airport to board the flight for Goa. Upon arrival in Goa meet Incredible India Tour representative for transfer to the Kenilworth / Cidade Goa. . Overnight stay. After breakfast, leave for a sightseeing tour of Goa, the "Pearl of the Orient". Take the beach tour of Goa visiting Calangute, Colva, Dona Paul and Miramar beaches. Also visit Panjim, the capital city of Goa. Visit the famous Churches of Goa viz. Basilica of Bom Jesus, St Cajetan Church and se Cathedral. Rest of the day free for leisure. Overnight stay. After breakfast, morning free at leisure in hotel. Later get transfer to the airport to board the flight for Mumbai. Upon arrival in Mumbai board the flight for onward destination.